Hey y’all! So is it just me or is time flying around here? Good gracious, I can’t believe it’s August already! As you know, this last month I’ve been pretty preoccupied with my upcoming move to Alaska. It’s been REALLY hard to focus on anything else let alone sit down and write blogs, but this one is kind of light and fun and I’ve been wanting to share it with you all. So, about two months ago I came across a website called Influenster (I have a link on the right hand side of my page if you want to check it out!). Essentially you create an account, select your interests and write reviews on products you really love or really don’t. The best part though, is that they give you products to test out. 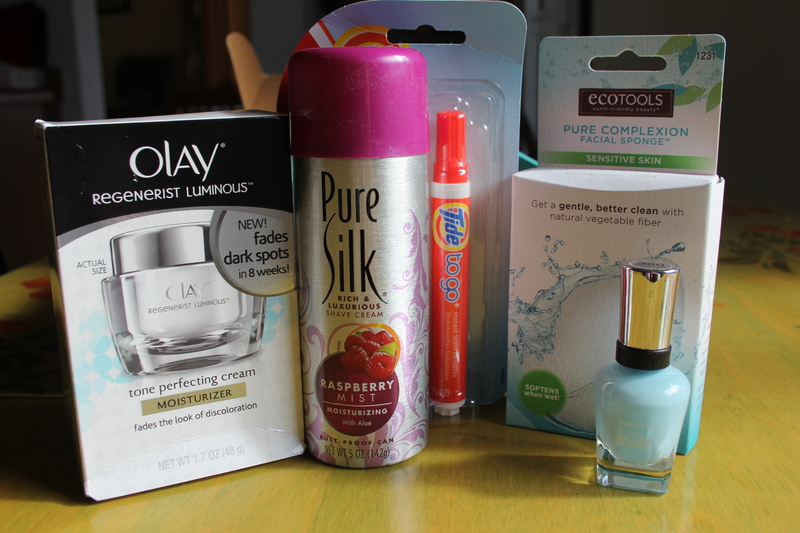 Periodically Influenster releases a new Voxbox. Each box has a different theme and comes with different products in it. A few weeks before the voxbox is sent out they send out email surveys to Influsester members who they think would be good to receive said box. No influenster member receives every box that’s sent out, and it’s not monthly like regular box services such as Birchbox. I was lucky enough to receive my first Voxbox survey about a week after signing up and found out a week after that that I’d been approved to receive the Vow Voxbox. It came in the mail while I was down in Mexico, so when I saw it on my table when I walked into my house I squealed with joy I was so excited! Olay Regenerist Luminous ($30.99)- I’m actually really excited about this. I have a lot of dark spots on my face so anything to make them go away. My routine is all messed up with all the prep for the move to Alaska so I haven’t started using it yet, but I can’t wait to! Pure Silk Shave Cream in Raspberry Mist ($1.49)- Ok, so I hardly ever use shave cream because I’m cheap and soap usually works fine, but this stuff rocks. It makes my skin soft, the shave feels closer and it smells like Raspberry which is my fav. An added bonus! Tide to Go Pen- I love love love this and have actually carried one in my purse for years now. I have a bad habit of dropping things on my clothes, especially food so this thing is a life saver! Eco Tools Pure Complexion Facial Sponge ($5.99)- This was another product I was waiting to get to Alaska to use. It’s hard as a rock, but from what I hear it gets a lot softer once you get it wet. If it can get my face really clean then I’m totally sold. I’ll get back to you on that one. Sally Hansen Complete Salon Manicure in Barracuda ($7.99)- I’ll admit, I’m more of a pink/coral girl when it comes to nail polish, but I actually really like this shade of blue. In fact I’m wearing it right now! It took three coats to get it really solid but I do really like the final look. Although I do suggest a good top coat, it took only about 12 hours for the color to start chipping. And finally a 50% off coupon for a wedding website with Riley & Grey. Obviously I’m nor get married anytime soon so this isn’t something I’ve used, but their sites look gorgeous, definitely not your typical wedding websites. So there you have it, the Vow Voxbox. It was pretty sweet if I do say so myself. Have any of you every tried any of these products? Let me know what you thought! Categories: Life | Tags: Influenster, Vow Voxbox, voxbox | Permalink.